I’m not talking of things which are called Chinese in India and are unheard of in China: like the gobi machurian. This post is about Chinese tea from China: three which I like, and use regularly are Tie Guan Yin (a sweet green Oolong), Da Hong Pao (a smoky red tea) and Yun Wu (an exquisitely aromatic green tea). The names are evocative. Guan Yin is named after the Buddhist goddess of mercy, derived from the male bodhisattva Avalokiteshwara. 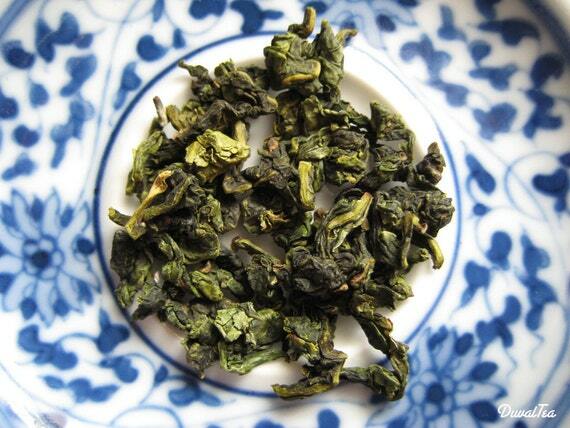 Da Hong Pao means big red cloak, after an emperor who cloaked the tree whose leaves cured his ailing mother. Yun Wu is the name I like best; it means mist and rain, and you can almost smell it in the brew. When I first encountered them in tea markets in China, they were all infused in boiling water for very short times: sometimes less than a minute. This is enough to release the flavour of the leaves, as I could tell on sipping the scalding brew. I learnt a lot about Chinese tea habits from these expeditions. But I’m an Indian tea drinker: not necessarily of the milk and masala variety, but I definitely like the brew to tickle my tongue as well as my nose. So I’ve had to experiment with not losing flavour while adapting the brew to my taste. A blog by Gingko Bay assured me that good leaves are ones which are good in many ways. I usually make Yun Wu by steeping the leaves in absolutely boiling water for about two minutes, covered to preserve the aroma. The resulting brew is a golden yellow in colour: deeper than most Darjeelings and wonderfully fragrant. When I treat the leaves this way I get only one brew from the leaves. This has become my favourite post-lunch tea at work. I adapted the traditional recipe when making Tie Guan Yin. I pour cold water into the leaves, and immediately pour it out into the drinking cups to remove any other aroma which they might have had. This preparatory process is called face washing in China. Then I pour the boiling water into the pot again to brew the tea. In China the tea is steeped for 30 seconds. I leave it in the pot for thrice as long. The resulting tea has a pale yellow colour, like Darjeeling, and an aroma to die for. The brew is strong enough for me, and it tastes sweet! The dried tea leaves are shaped like little balls which open up into wide leaves after the steep. If I start this brew in the morning, then about 10 grams of leaves gives me tea for the whole day. That’s why I use this on weekends when I’m home. Da Hong Pao is a red tea, which I have come to brew slightly against tradition. The amount of water I use is somewhat less than what the traditional Chinese recipe calls for, and I’ve increased the brewing time from 45 seconds to about twice as long. The tea comes out dark red in colour, with the tannins which I like in an Indian tea, but with the smoky taste of the original intact. As you can see, I’ve Indianised the recipes by brewing the tea a little longer than the Chinese would, and by covering the tea while it steeps. I wonder whether there are other techniques for Indianizing these lovely aromatic teas, while still staying true to the flavour of the Chinese. I’ve never known anyone who ‘overclocks’ their tea like this. Technically, isn’t it ‘ruining’ the tea leaves? I’ve been told to always leave green tea steeping uncovered, while black tea is better covered. It would make sense, however, if one’s palate is more accustomed to Indian style teas, that by brewing and steeping as you do, one would come closer to that flavor and aroma. In general I don’t tend to ever use scalding water for anything more delicate than an oolong. A lot of the tea’s character is lost by ‘burning’ the leaves. However, I’m curious if perhaps in years to come, if innovative tea sellers will start doing what you do to add a larger range of possible flavors from one same tea. I’d be curious to try the opposite too. What’s trending now is cold brew coffee. What about cold brewing a nice dark darjeeling, or steeping it for shorter periods of time in less hot water? The effects may be bland compared to your particular adjustments, but perhaps we’re just missing THE perfect method to bring out the nicest array of aromas and flavors! Whenever I’ve been served tea in China, the water was boiling. There are a few Chinese teas which can be used with tepid, or even cold, water, but these are special. The difference between most Chinese brewings and mine is only in the “overclocking”. Since this might cause the aromatic components to evaporate, you need to hold them in. Everything else follows from that. I guess any way of extracting the flavour completely would be interesting. Darjeelings are very finicky, and seem to need the temperature. But maybe a 12 hour steep in cold water… Who knows. Then again there are solvents used in molecular gastronomie to extract flavours. They might be interesting. Molecular gastronomy is also where my mind was when I mentioned the cold processing and ‘new ways’ of brewing tea. Nice write-up.We have a good amount of Indian Chinese restaurant in Chicago which many of us like and of course those entrees you can not get in a Chinese restaurant. But we do not get Indian Chinese Tea here! You’ll probably get Jasmine tea I guess. Thanks for dropping by.